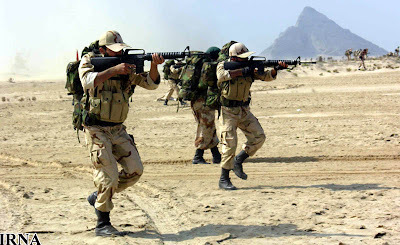 Within the Iranian armed forces it is the main rifle of the Basij, the IRGC as well as specific units with both the regular army and the police. The AK-47 is likely the most infamous rifle in the world, gaining its reputation in nearly every conflict as a powerful and rugged weapon. The original, along with its variants holds the title of being the most produced assault rifle in history, being more then all other rifles combined. 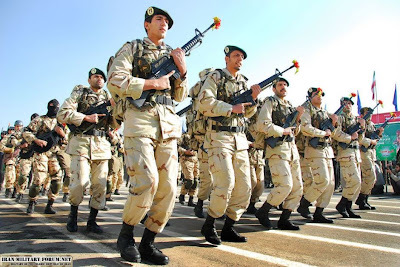 Within the Iranian armed forces it is the main rifle of the Basij, the IRGC as well as specific units with both the regular army and the police. Multiple versions are produced, such as the basic AK-47 model, known locally as the KLS, the folding stock AKS-47, known as the KLF and AKMS (side-folding-stock AKM) known as the KLT. They different versions are produced both with wooden and synthetic stocks. One notable feature over the base soviet models is the addition of an M203 grenade launcher. In addition to this, they still maintain large stocks of older rifles purchased directly. The most common type is the KLF and AKMS with a wooden handguard, being used by the army and the majority of the IRGC. However the fixed-stock KLS is far from being uncommon. Refurbishment stockpiles with newer rifles is done on a regional and organizational manner, not necessarily according to which regions need it, for instance, the lowest-of-the-low, hardscrabble Basij in Qom are often seen with brand-new rifles while a regular army garrison on the Iraqi border might still be making do with older foreign rifles. Although that is really the beautiful thing about the AK-47, the quality between the rifle that’s brand new and the one that’s been there since the end of the war, isn’t that much. The models with synthetic material are still uncommon, though are used regularly by the police with only a few being seen in service with the IRGC. 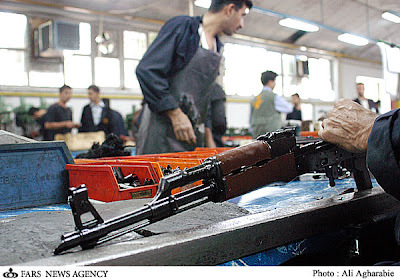 Use by the police is often determined by location, for instance police in Tehran usually carry pistols, or maybe MP-5’s or a rare AK-47, while those in Zahedan carry an AK-47 as part of their regular kit. The G3 was developed by Heckler and Kock as a main battle rifle, not an assault rifle. It’s an extremely accurate and extremely powerful, but at the same time, it’s more a rifle then an assault weapon. The G3 is the main rifle in the regular army as well as the navy and airforce. It is officially known by HK as the G3A6 as the model designated for the liscenced model in Iran. 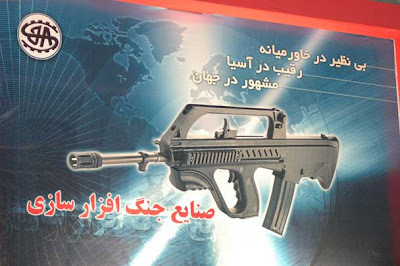 Surprisingly, Iran has retained the original German names for weapons, unusual given the Iranian penchant for naming everything they produce at least three times with completely different names. The main model used is the G3-A3 with a fixed plastic stock. Also used is the G3-A4, essentially the same as the A3 model but with a collapsible stock. The two models appear to be distributed fairly evenly throughout the services, the only possible preference is with “elite” units who seem to favour the collapsible stock model. The third model is known as the G3-A3, otherwise known as the ‘return to naming confusion’. This specific model is a bullpup conversion of the original G3 rifle and is known by most merely as the “bullpup G3. The conversion appears quite straightforward with merely shifting the grip forward and the addition of a carrying handle and new sights. This latest model has yet to enter service, existing now only as a few prototypes. 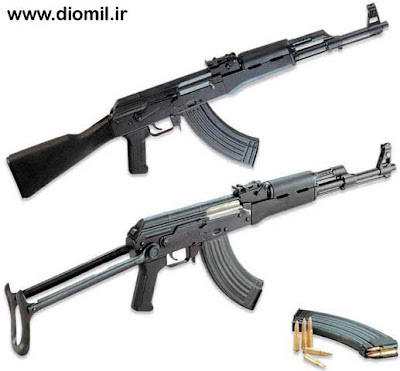 The Iranian-produced versions have a few distinguishing features, first is that the stock and hand guard are green. While this might not be unique trait, it does help distinguish the older models that were directly purchased are black, whereas the new indigenous models still have a dark green stock and hand guard. Another feature is the addition of an M203 grenade launcher, though the hand guard must be removed and directly attacked to the barrel. 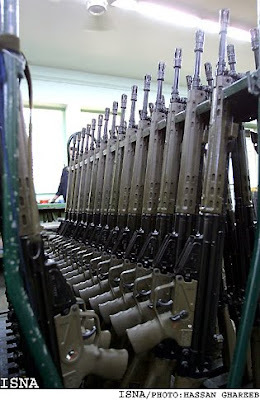 Like the AK-47 the distribution of new rifles is nowhere uniform, with some units in the marines receiving brand new G3-A4’s, with other still trudging along with models that are losing their paint entirely. The police however notably use a model of the G3-A3 that is a bright orange as a sharpshooter rifle. Optics are rarely seen in the Iranian army, therefore its hard to see what type are used with the G3, from the few shots we have show them with simple telescopic sights, or with night vision, both conventional and IR sights. The rifle is a copy of the Norinco CQ assault rifle, itself a copy and improvement of the M16A1. It’s a lightweight, accurate assault rifle. 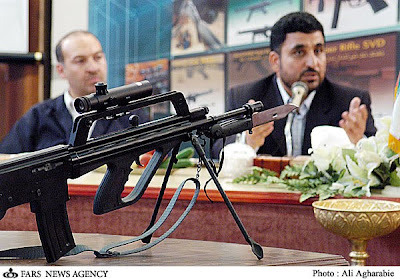 It was originally developed by the DIO to be an export-only weapon, though since this announcement it is clear this policy has changed as Iranian troops have been seen equipped with it. However there are several key differences from the original M16A1. The Chinese changed the shape of the plastic grip and hand guard, giving the latter a distinctive circular tube-shape. They also changed the type of metal used, allowing it to be injection moulded rather then forged. They also changed the rifling of the barrel to match their specific rounds, while it still accepts NATO rounds, the ballistics would be slightly compromised. 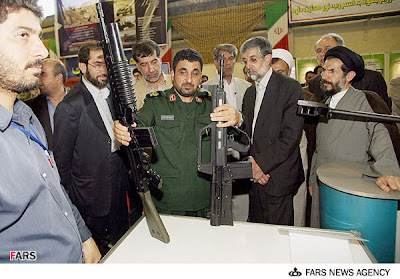 When the Iranians got their hands on it the produced two versions of it, one with Chinese rifling, and one with conventional rifling, labelled the S-5.56 A1 and S-5.56, respectively. They also produce a model of the rifle with regular M16A2 style hand guards that enable an M203 to be mounted without necessitating the complete removal of the hand guard. Optics are frequently seen used on this rifle, the only confirmed type are simple telescopic sights mounted to the carrying handle, but the use of different types of night vision scopes can be assumed. The S-5.56 is used currently only by the IRGC and likely the Police. The rifle is often seen as police expos so its use is likely, though we have never seen them actually used by an active unit. On the other hand, they are the standard weapon of IRGC elite commando and airborne units. The Khaybar is an indigenous Iranian rifle that and is undoubtedly what many of you thought of as you read the title of this. However it is also cause for much debate and contention because there isn’t a lot known about it. It goes by its earlier name, Khaybar as well as the name of the newer model, the Sama. The Khyber is bullpup conversion and adaptation of the S.5.56 rifle, though with several distinct features. The rifle has a four-position fire selector, safety, single shot, 3-round burst, and automatic, located on the rear of the stock in the same manner as the Chinese QBZ-95, never moved from its original position. Unfortunately this forces the shooter to change position every time they change firing mode, a poor choice in the midst of a fire fight. The question of sights is an interesting one, there are several different styles. The first type is accompanied by a carrying handle that is identical to that on the S-5.56, and is accompanied by the forward sight mounted on the end of the gas piston tube. This appears to have been replaced by a longer carrying handle that includes both the forward and rear sights, doing away for with independent forward sight altogether. There has been talk about the possibility of the ejector being reversible, this is possible but this is not true, the image people are claiming as proof that it is capable of ejecting to the left (as opposed to the normal right) comes from the original Diomil poster of, but what isn’t realized is that Diomil uses mirror images of their products when putting them up on poster. This is confirmed by viewing the fire selector knob on the supposed “right side” of the rifle. The rifle comes in three different versions, the first is the assault rifle version which everyone is accustomed to viewing, with a 730 mm long barrel, second is the carbine which has only been seen once in a grainy photo, with a 680 mm long barrel, it appears to be the same, but with a shortened barrel. There is also a third, designated marksman version that has never been seen, with a 780 mm long barrel. It can hold either a 20 or 30 round magazine, the former being by far the most common. Other accessories include a bayonet with wire cutter, a bipod as well as telescopic sights and night vision, both being mounted directly to the carrying handle. There is some debate as to whether the gas operated reloading system is a direst copy or whether its something else entirely. While there are those who claim the Khaybar is a direct copy of the M16 with the direct impingement style, there are also those who say it uses the short-stroke piston model, characteristic of rifles such as the AR-18. This has the advantage of reducing the overall mass moving mechanism, enabling better control, it also proves much more durable then the mechanism on the M-16 as well as being able cheaper and simpler to produce. This particular theory is backed up by the presence of a thick cylinder on the top of the rifle that holds the piston. More recently, a second model of the Khaybar was released, officially known as the Sama, but really just a development of the original Khaybar. The Sama was different from the Khaybar in several distinct ways. First is a cosmetic change to the charging handle, likely just making it easier to use. There is also the addition of several rails mounted to the front side of the weapon for mounting of aids like lasers or flashlights. There is also the addition of knobs for adjusting of the sights. In front there is a forward grip attacked the trigger guard, an improvement over the original model where there was barely any place for ones forward hand. The carrying handle has also been permanently lengthened. There is also the question of sights. As with the first model there appears to be two different types, first with just the carrying handle with both rear and forward sights, then those with the an independent QBZ-style sight mounted on the front of the barrel. Some have criticized these for appearing to flimsy and weak, though of course this cannot be confirmed. The only possible explanation for this is that both types are still in develop and have yet to enter serial production. The Khaybar has not entered widespread service with any specific branch yet, however it has been seen mass produced for at least one small IRGC unit. The unit in question is a special operations force, probably smaller then a brigade, though could potentially be Brigade sized. The only information we have on them is that they use powered Para gliders as well as powered hang gliders.